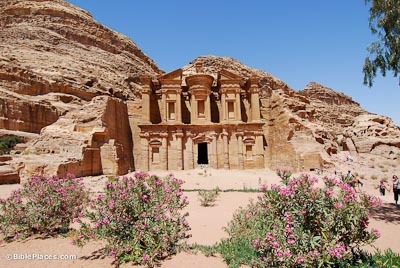 Petra was chosen as the capital of the Nabateans because it was located in a valley surrounded by sandstone mountains. There are many ways to get into Petra, but none of them are easy, and if the valleys are sealed, it is almost impossible for anyone to enter. The main entrance to Petra is called the Siq; it has sides as high as 200 m (650 ft). This gorge and the temple at the end of it (the Kazneh) were popularized in American culture in the movieIndiana Jones and the Last Crusade. 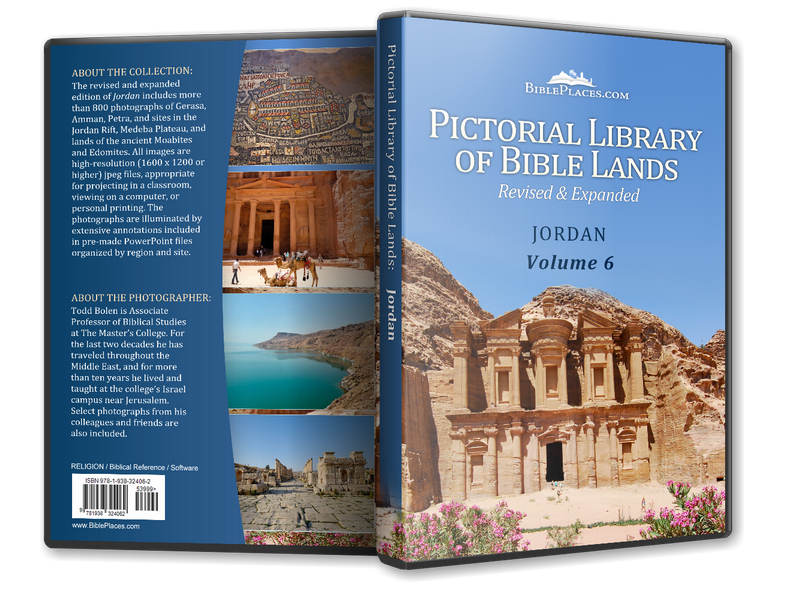 Knowledge of Petra was lost to the Western world until John Lewis Burckhardt tricked his Bedouin guides into leading him there in 1812. 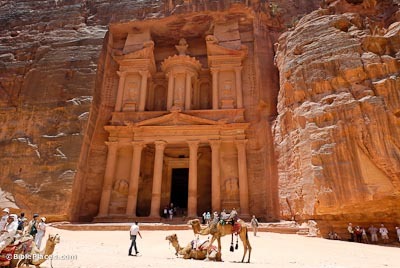 Of the 800 carved tombs in Petra, the Kazneh is the most famous. Its name Kazneh means “treasure” and comes from the Bedouin belief that the Pharaoh chasing the Israelites hid his treasure in the urn at the top of the Kazneh. Tomb facades were built from the top down. Scaffolding was built and then grooves were carved into the rock. Into these grooves were inserted pieces of wood, which when made wet, expanded and cracked the rock. 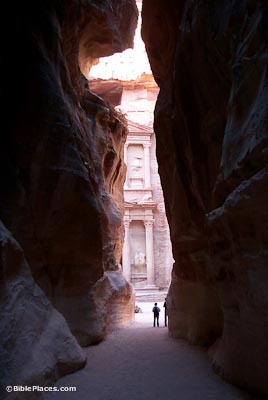 As many as 30,000 people may have lived in Petra during the 1st century AD. 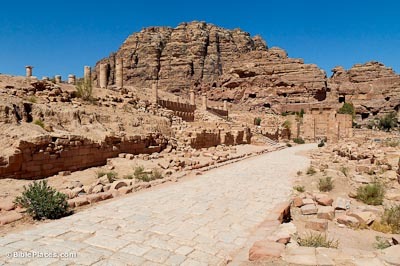 It is a misconception that Petra was a city only for the dead. A large earthquake in AD 363 destroyed at least half of the city. Petra never recovered from this destruction. 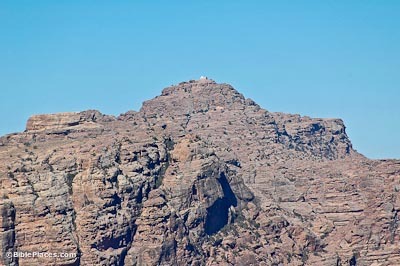 The Monastery is the largest tomb façade in Petra, measuring 50 m wide and 45 m high. Despite its name, it was built as a tomb monument and may have acquired its name from the crosses inscribed inside. Like the Kazneh, the structure consists of two stories topped by a magnificent urn. The architectural detail of the Kazneh is not evident in this building. Scholars debate who the designers and builders of the tombs of Petra were. They were probably the product of local workers and artisans brought in from Alexandria and Rome. 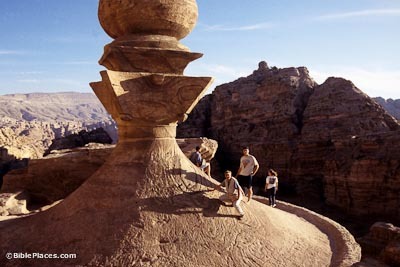 The monuments are Nabatean in style, but they incorporate classical, Egyptian and Mesopotamian elements.